A bus full of passengers comes to a halt in an empty lot. Police on-site tell us there are two terrorists on this bus—and they’re carrying a biological weapon. Three unmarked vans pull up nearby—two stopping at the rear, and the third at the nose. As the van doors slide open, police officers in gas masks and bulky vests pour out and move swiftly toward the screams coming from the bus. As the chaos of the situation unfolds, one thing becomes readily apparent: when the SPVM stages a fake terrorist attack, they make it look and sound like the real deal. The crack of two gunshots fired from inside the bus cuts through the cold morning air. One of the officers lobs a grenade through the open door, causing smoke to quickly spread throughout the stationary vehicle. There’s no hostage negotiation, and no warning for the suspects to come out with their hands up. The officers rush into the bus and neutralize the threat. One assailant in a gas mask is brought out with an apparent bullet to his thigh, and the other man is dragged out in handcuffs. 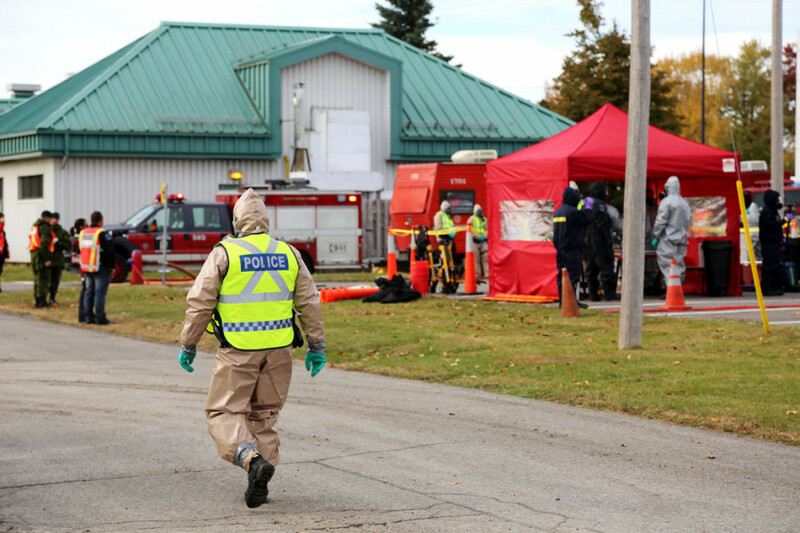 This past Saturday’s early morning simulation at the Longue-Pointe military base was part of a larger initiative to improve preparedness in the face of a possible terrorist attack in Montreal. The project—dubbed Montreal 360—was organized by the Comité aviseur antiterrorisme de Montréal (CAAM), which includes the SPVM, the Sûreté du Québec and the Department of National Defence. 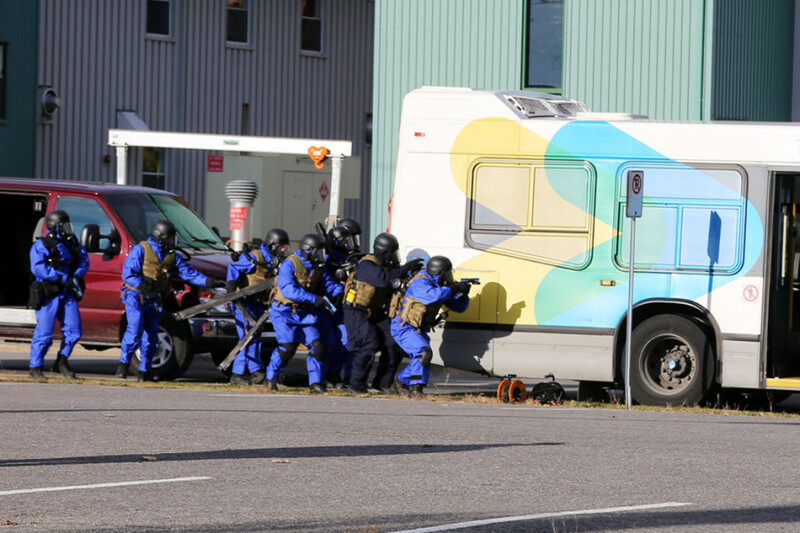 According to the SPVM, the exercise was the most significant of its kind since 2005 and involved the participation of over 350 emergency responders. 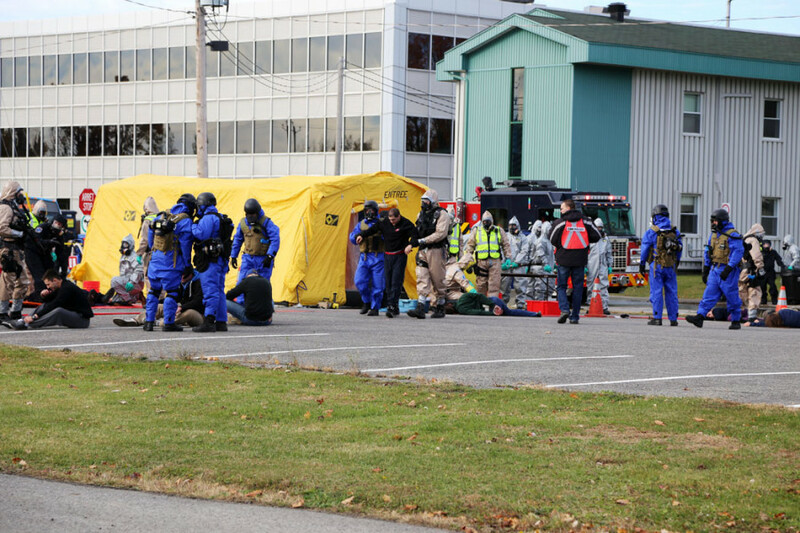 Once the simulated attack was brought to an end, personnel in HAZMAT suits were brought in to quarantine the area. The fake victims from the bus—some playing dead in temperatures hovering around zero degrees—were then laid down on the ground, separated and assigned numbers. A small tent and an emergency clinic were quickly set up to deal with the immediate medical needs that would arise in the real world. An SPVM officer narrated the events over loudspeaker, explaining the process to journalists and the 50 or so observers from the Montreal police service present at the event. Hours later, another simulated attack took place at the Black Watch Armoury on Bleury St., where two terrorists set off explosives and opened fire on Armed Forces members on the street outside the building. As the assailants made their getaway on foot, the victims of the staged assault cried out convincingly in pain. Montreal police warned residents days in advance that the operations would make use of blank firearm rounds, which would be audible in the downtown core. Many streets were blocked off, mostly around Place des Arts and SPVM headquarters. The downtown exercise attracted a lot of attention however, with bystanders watching from behind barricades, and confused apartment dwellers peering out of their windows to see the source of the commotion.